The idea of uniformitarianism—“the past is the key to the present”—is crucial in understanding current tectonics. A small group of geologists extend this assumption even further, claiming that the past is also key to the future. The East African Rift is a continental divergent boundary between the Nubian plate and the Somalian plate (see Fig. 1), which includes the smaller Madagascar plate and the Seychelles Plateau. The rift extends from the Afar Triangle—a triple junction of the Nubian, Somalian, and Arabian plates—to the Antarctic plate, however the rift has not been fully mapped in southern Africa. The Afar Triangle (see Fig. 2) has already lost half its thickness, due to the three plates diverging from one another (Haddok, 2008). The East African separates the Nubian plate from three microplates; Victoria, Rovuma, and Lwandle plate (Corti, 2009). The Lwandle plate and Nubian plate create triple junction with the Antarctic plate (Corti et al., 2007). If these motions continue, plate models (mentioned below) suggest that Africa would rotate clockwise and eventually crash into Europe in 50 Ma in the future. The rift is growing at a rate of one inch per year through the upwelling of magma underneath the continental crust (see Fig. 3). The new ocean created by this rift will be a continuation of the Red Sea; the divergent boundary between the African and Arabian plates. Within 10 Ma, the rift will be completely flooded by the encroaching sea and Somali will become an independent plate (Emerick and Duncan, 1982). In 2005, the Dabbahu (yellow box in Fig. 3) volcano—similar to the Icelandic volcanoes—produced a 500-meter crack in the crust as a result of the intrusion of a solidified magma dike 60 km long (see Somali Page's Volcanics section). Given the current growth rate, the crack will reach the Red Sea in about 4 Ma (Campbell, 2009). It is speculated that the crack will be met by the rift extending from the Afar Triangle such that the Red Sea will flood the area in ~ 1 million years (Emerick and Duncan, 1982). Figure 4. Final plate preconstructions of the future supercontinents 250 Ma hence (Williams, 2007). 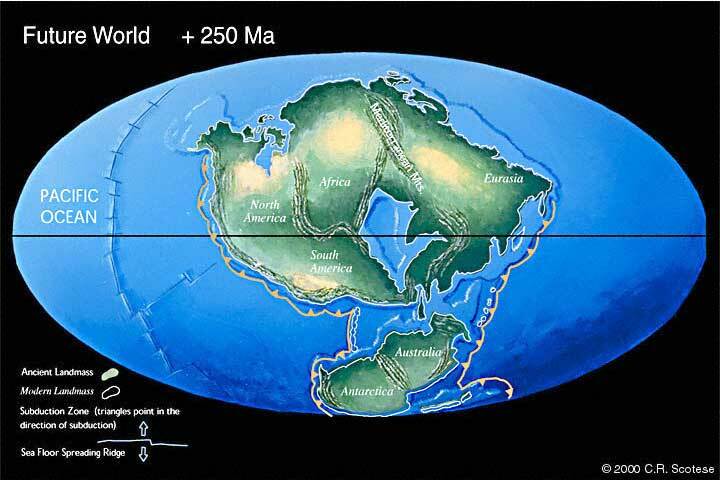 The Earth has a cyclic pattern of amalgamation and subsequent rifting of supercontinents, entitled the Wilson Cycle. 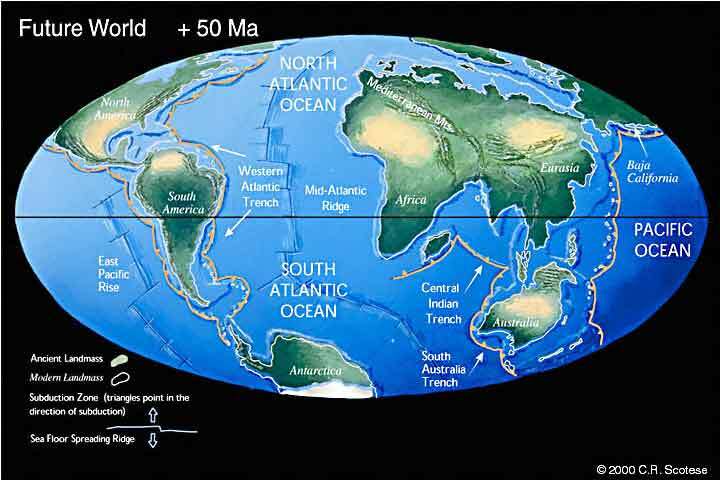 Within 250 Ma, another supercontinent amalgamation is probable (Williams, 2007). However, the movements and final locations of the plates are debatable. Nield (2007) highlights 3 different potential models for the creation of the supercontinent - the "Novopangea" model (Livermore, 1992), the "Amasia" model (Hoffman, 1997), and the "Pangea Proxima" model (Scotese, 2000). (see Fig. 4). The first few millions of years in the three models are just extrapolations of current plate motions. The models differ once 100 Ma is reached and the model operator decides what may happen next (Nield, 2007). The operator, using uniformitarianism as a guide, conjure plate movements. The Amasian model ( see Fig. 5) spearheaded the preconstruction model interests. Paul Hoffman, in 1992, created a preconstruction of future Earth based on the premise that the Atlantic Ocean will continue to open while the Pacific Ocean will continue to close. Amasia follows the process known as extroversion where plates from the previous continent reassemble on the opposite side of the globe (Nield, 2007). The Africa-Eurasia-Australasia amalgam eventually collides with the Americas that swing clockwise around a NE Siberian pivot (Williams, 2007). 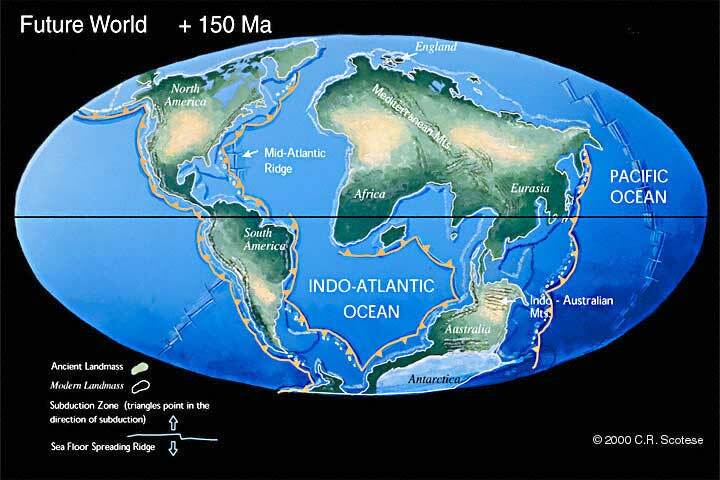 In the Amasian model, East Africa and Madagascar rift from the Nubian plate and then subsequently travel across the Indian Ocean and collide with Australasia amalgam. This motion, 100 Ma outward, creates a seaway connecting the Indian and Atlantic Ocean (Williams, 2007). 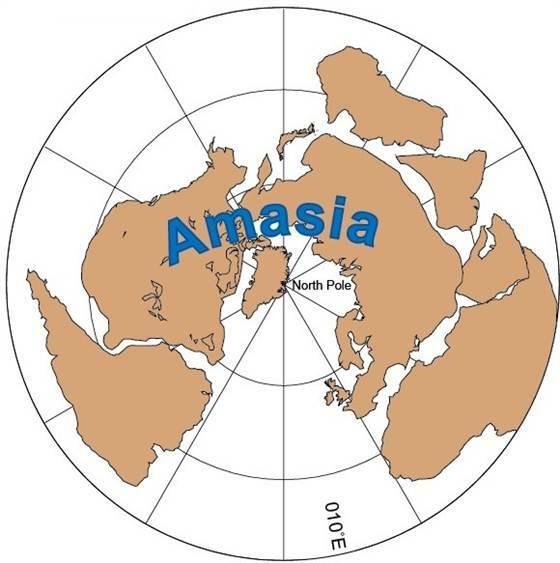 The motion of the Antarctic plate differentiates Novopangaea and Amasia; the Antarctic plate is stagnant in the Amasia model; Hoffman reasons that the Antarctic plate will not move as there is no subduction zone to pull toward the supercontinent (Williams, 2007). A new improvement in the Amasian model can be read here. Roy Livermore’s preconstruction, like the Amasian construction, is based on the premise that the Atlantic Ocean will rift while the Pacific Ocean will subduct (Nield, 2007). Novopangaea also assumes the process of extroversion. 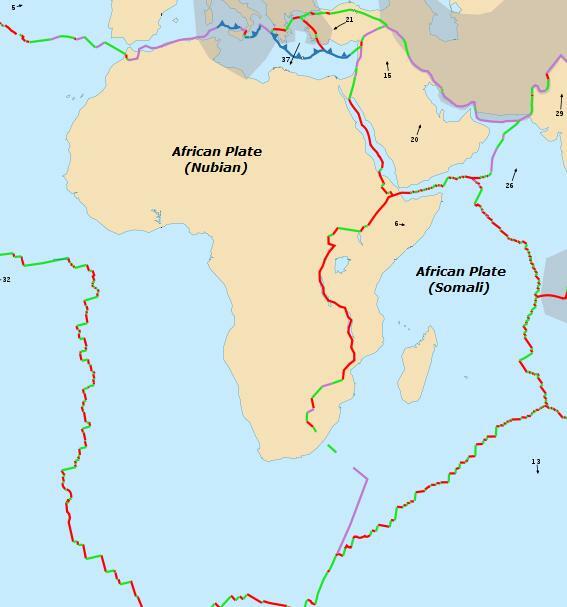 Livermore is also a proponent for the Somali plate rifting from rest of Africa because of East African Rift, thus, the eventual collision with the Asia-Australian amalgam (Williams, 2007). In Livermore’s preconstruction Antarctica moves northward via a subduction zone and amalgamates with the rest of the supercontinent. Livermore justifies the movement of the Antarctic plate with uniformitarianism, stating that Gondwana involved all of the southern plates (Nield, 2007). Animation of the past Earth into future Earth using the Pangaea Proxima model (Scotese, 2000). Figures 6-8. Pangaea Proxima preconstruction by C. Scotese. Chris Scotese’s model works on the same premises as the others; however, differs greatly near the final amalgamation of the next supercontinent. Similar to Novopangea and Amasia, the model predicts that in the next 50 million years Africa will continue rotating clockwise and northward, closing the Mediterranean as Australia collides with Asia (Scotese, 2000). However, Scotese believes a subduction zone will form on the west side of the Atlantic. Eventually, as seen in Figs. 6-8, the Mid-Oceanic ridge is subducted, the expansion ceases, and Euro-African continent ultimately crashes into North America (Scotese, 2000). Scotese hypothesizes, utilizing uniformitarianism, that, as seen in the past, once a mid-ocean ridge gets too close to one of the margins, it is subducted (Scotese, 2000). It is worth noting, this model projects that the East African Rift will not create a new seaway in the formation of Pangaea Proxima (Scotese, 2000); the reasoning is undisclosed on the preconstruction website. A missing piece, two important warm zones in the mantle, from all of the plate models aforementioned can be read about here and the newest plate model including the warm zones can be found here. Campbell, M. 2009. Giant crack in Africa formed in just days. New Scientist. Available at http://www.newscientist.com/article/dn18114-giant-crack-in-africa-formed-in-just-days.html. Corti., Giacomo. 2009. Continental rift evolution: From rift initiation to incipient break-up in the Main Ethiopian Rift, East Africa. [Firenze, Italy]. Elsevier Earth-Science Reviews.Vol 96, Issues 1-2, Pages 1-53. Haddok, Eitan. 2008. 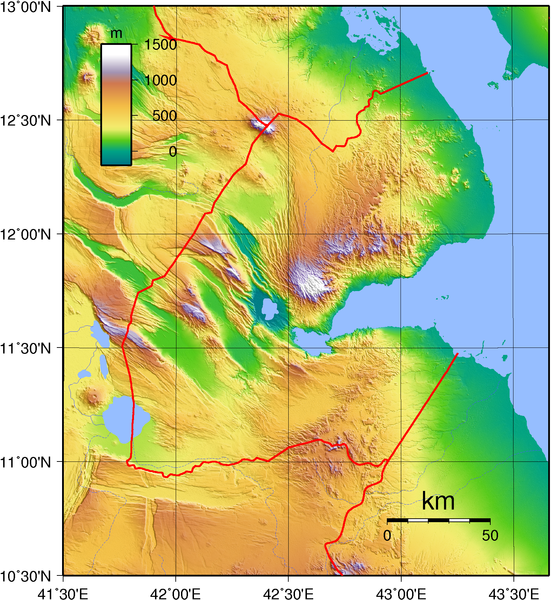 "Birth of an Ocean: The Evolution of Ethiopia's Afar Depression." Scientific American Global RSS. Scientific American Web. 30 Jan. 2014. Williams, C 2007, 'Earth's next supercontinent', New Scientist, 196, 2626, pp. 36-40, Academic Search Complete, EBSCOhost.